Riding a Comet: What's Next for Rosetta's Philae After Historic Landing? Europe's Rosetta orbiter photographs the mission's Philae lander after it deployed and headed down to the surface of Comet 67P/Churyumov-Gerasimenko on Nov. 12, 2014. This story was updated at 4 p.m. EST on Nov. 13. 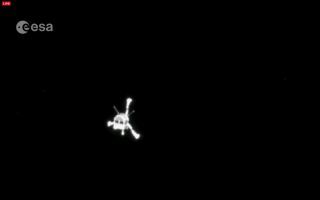 The next few days will be action-packed for Europe's Philae lander, which pulled off a historic comet landing on Wednesday morning. Philae, part of the European Space Agency's (ESA) Rosetta mission, touched down on Comet 67P/Churyumov-Gerasimenko early Wednesday (Nov. 12), becoming the first spacecraft ever to make a soft landing on one of these icy remnants of the solar system's long-ago formation. Philae appears to have survived its dramatic landing in good shape, which means that it's already quite busy gathering data. The mission plan calls for the lander's "first science sequence" phase, or FSS, to start immediately upon touchdown and continue until its primary batteries run out. This will likely happen after two to three days, ESA officials have said. "The FSS provides 'a first taste of the comet' in a way impossible to achieve through a flyby or orbiting spacecraft," Philae lead scientist Hermann Böhnhardt wrote in a blog post in September. After FSS comes the long-term science phase, during which Philae will be powered by backup batteries recharged by solar cells. Philae will take photos of 67P's surface and use 10 different instruments to gather a variety of data during both of these science phases. The lander "will do an on-the-spot analysis of the composition and structure of the comet’s surface and subsurface material. A drilling system will obtain samples down to 23 cm [8 inches] below the surface and will feed these to the spectrometers for analysis, such as to determine the chemical composition," ESA officials wrote in a Rosetta FAQ. "Other instruments will measure properties such as near-surface strength, density, texture, porosity, ice phases and thermal properties," they added. "Microscopic studies of individual grains will tell us about the texture. In addition, instruments on the lander will study how the comet changes during the day-night cycle, and while it approaches the sun." Meanwhile, the Rosetta mothership will continue studying the 2.5-mile-wide (4 kilometers) Comet 67P from orbit. Together, the Rosetta orbiter and Philae should help reserachers learn a great deal about comet composition and behavior, which in turn should shed light on the conditions prevalent during the solar system's early days, mission officials say. The $1.3 billion Rosetta mission launched in March 2004 and rendezvoused with Comet 67P a decade later. On Aug. 6 of this year, the Rosetta mothership became the first probe ever to enter orbit around a comet. While Philae's work may end in a few months, the orbiter should keep gathering data through at least December 2015, ESA officials say.